Last month, Sansour made headlines when the French clothing firm Lacoste expelled her from the Lacoste Elysee Prize, awarded by the Swiss Musee de l’Elysee. 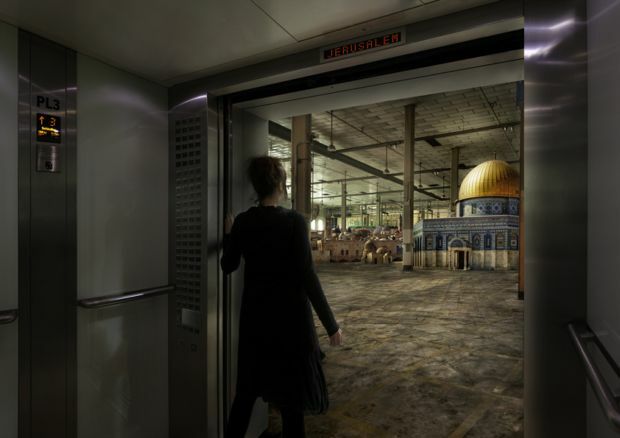 Sansour had been one of the eight finalists shortlisted for the prize when she issued a press release stating that her work had been censored for being “too pro-Palestinian.” Her work, a multimedia project titled ‘Nation Estate’, depicted a world in which the entire Palestinian was housed within a single skyscraper, with lost cities recreated on the different floors. Larissa Sansour answered questions posed by Musab Younis, Ceasefire’s Deputy Editor, on the Lacoste Prize and the complexities of being a Palestinian artist. Musab Younis: Could you describe the images you submitted to the Lacoste Prize which were labelled too “pro-Palestinian”? 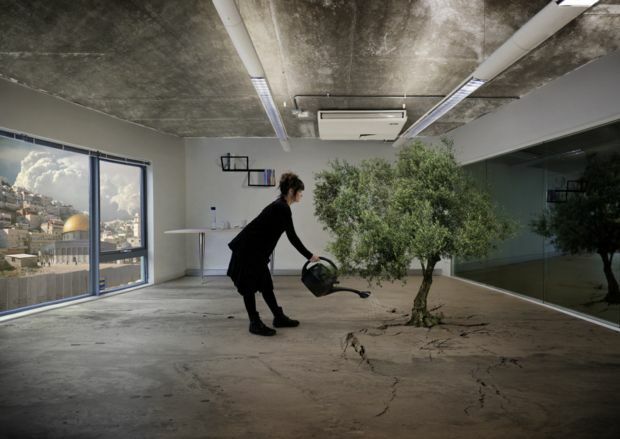 Larissa Sansour: The NATION ESTATE project is a sci-fi photo series conceived in the wake of the Palestinian bid for nationhood at the UN. I developed three preliminary sketches especially for the Lacoste Elysée Prize. Encouraged to approach the theme of the competition, ‘la joie de vivre’, indirectly or even with irony, I decided on a slightly dystopic approach. Set within a grim piece of hi-tech architecture, this narrative photo series entitled Nation Estate envisions ‘la joie de vivre’ of a Palestinian state rising from the ashes of the peace process. In this vision, Palestinians have their state in the form of a single skyscraper – the Nation Estate. Surrounded by a concrete wall, this colossal high-rise houses the entire Palestinian population – finally living the high life. Each city has its own floor: Jerusalem, third floor; Ramallah, fourth floor. Intercity trips previously marred by checkpoints are now made by elevator. 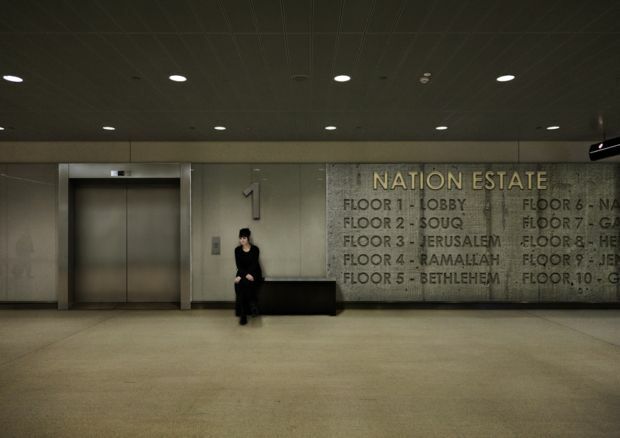 Aiming for a sense of belonging, the lobby of each floor reenacts iconic squares and landmarks – elevator doors on the Jerusalem floor opening onto a full-scale Dome of the Rock. Built just outside the actual city of Jerusalem, the building has views of the original golden dome from the top floors. MY: What kind of reaction have you received since the prize was cancelled? LS: The response has been absolutely overwhelming. Since I released a statement telling the story of my nomination being revoked by Lacoste, I have received hundreds of emails stating support, and my story has featured in mainstream newspapers, magazines, blogs and on television channels worldwide. I am deeply grateful for all the support. I also applaud the museum’s decision to break off their relationship with Lacoste, cancel the prize and side with the artist instead of the corporate sponsor – even if it took them a while to gain the courage. Many of the people who supported me have written directly to the museum and praised them for this move. MY: You said in an earlier interview that “As a Palestinian artist, this is not the first time works of mine or shows I have been in have been exposed to politically-motivated pressure.” Could you talk about some of the other instances in which this has happened? LS: This kind of pressure is not uncommon, and it has expressed itself in various forms over the years. I have experienced several calls to close down exhibitions I have featured in. These calls normally come from special interest groups opposing any kind of rights, let alone statehood to Palestinians. But there have also been attempts at muffling my work from people initially favourable to it. I have been asked by gallerists showing my work to change the title of my exhibition or a specific piece in order to avoid aggravating Jewish communities, for example. MY: What do you think the recent addition of Palestine to UNESCO means for Palestinian artists? LS: I think we have yet to understand the full value of this membership. Symbolically, though, it is a very important step in the right direction. MY: What is your perspective on the wider issue of corporate sponsorship of the arts, particularly art prizes? LS: I am not opposed to the idea of corporate sponsorship per se. Administered well, financial support from institutions that can afford it is a valuable asset to artistic production. But the rules of the game have to be respected. Art prizes are not advertising campaigns for the sponsoring corporation. As soon as a sponsor blocks, censors or attempts to limit the artistic freedom, the system has failed. In the case of the Lacoste Elysée Prize, I am happy that the museum eventually decided to acknowledge this and cancel the prize. MY: Are there specific contradictions, difficulties or paradoxes you feel you have to navigate as a Palestinian artist? LS: Funding a Palestinian art project can be quite difficult. On several occasions, sponsors have demanded that a certain project of mine also presents an Israeli perspective. I have never understood the logic behind this. Asking the occupied to introduce the position of the occupier seems at best misguided. MY: Do you feel that there is an expectation of the kind of work you will produce because you are Palestinian? How do you navigate such expectations? LS: Palestinian work tends to be very political, and most institutions showing Palestinian artists are interested in this approach. This does not mean, however, that artists produce political work in order to meet expectations. For all Palestinians, politics is not just an option, but a fundamental circumstance. MY: Thank you for talking to Ceasefire. Larissa Sansour’s The Nation Estate project consists of 8-10 large-format photos. It is scheduled for production in early 2012. In addition to the photo series, a sci-fi video version of Nation Estate is currently in production.